Congratulations to the team from Pacific Northwest National Laboratory and Hummingbird Scientific on receiving a Microscopy Today 2012 Innovation Award. The award honors groundbreaking imaging products and methods. The honorees are Jun Liu, Chongmin Wang, Don Baer, Suntharampillai (Theva) Thevuthasan, Wu Xu and Jiguang (Jason) Zhang from PNNL; and Daan Hein Alsem and Norman Salmon from Hummingbird Scientific. The innovation is a multimodal electrochemical probe for transmission electron microscopy, or TEM. It enables versatile in situ electrochemical experiments inside a TEM column while imaging at high resolution. The innovative feature of this probe is the removable chip machined from “cheap” printed electronic boards that can be modified into miniaturized electrochemical devices. The relatively large size of the chip and the ease of machining different configurations allow a wide range of electrochemical devices to be implanted on the chip. Much of the development work was to study battery components in real time in their native environment, during charging and discharging cycles. 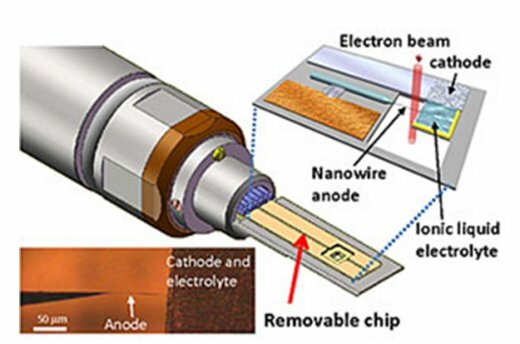 The team has used the probe at EMSL to build a lithium-ion nanobattery on the chip for in situ TEM observation of the electrode during dynamic charging and discharging of the battery. Findings from this study were featured in Nano Letters. Researchers from Pacific Northwest National Laboratory and Hummingbird Scientific built a multimodal electrochemical probe for transmission electron microscopy. “I’m very proud of the imaging advances the team has achieved,” said Dr. Lou Terminello, lead of the Chemical Imaging Initiative at PNNL.